Weston provides remedies necessary to protect human health and the environment by delivering remedial investigation/feasibility study documents with remedial action using large-scale in-situ biodegradation (ISB) injections in high-security areas of Joint Base Andrews (JBA). The overarching goal of the Air Force (AF) is substantial reduction of long-term environmental liabilities by using innovative technologies and optimizing remedial actions, with the result of maximizing the number of sites advanced to site closure (SC) or as close to SC as practicable during the period of performance. Weston manages the restoration of four chlorinated solvent groundwater contamination sites, successfully navigating the CERCLA process to complete multiple ISB and In-Situ Chemical Reduction (ISCR) injections at three of the sites. One of the AF’s main concerns was remediation impacts to airfield operations, especially the presidential mission. Our team overcame potential security, scheduling, and access challenges through good communications and planning with base operations to successfully implement a 2- month ISB injection program within the Air Force One operational/security area. Weston is currently implementing an ISB/ISCR injection program at SS-26 within the parking area for F-16 fighter jets that provide security for the nation’s capital, working successfully with multiple airfield stakeholders. At site SS-11, located off-base in a residential area, Weston worked with the AF to implement a community outreach program, including fact sheet mailings, public meetings, and a poster session that alleviated local homeowner concerns to the extent that community members expressed confidence in the remedial approach and the AF technical team. 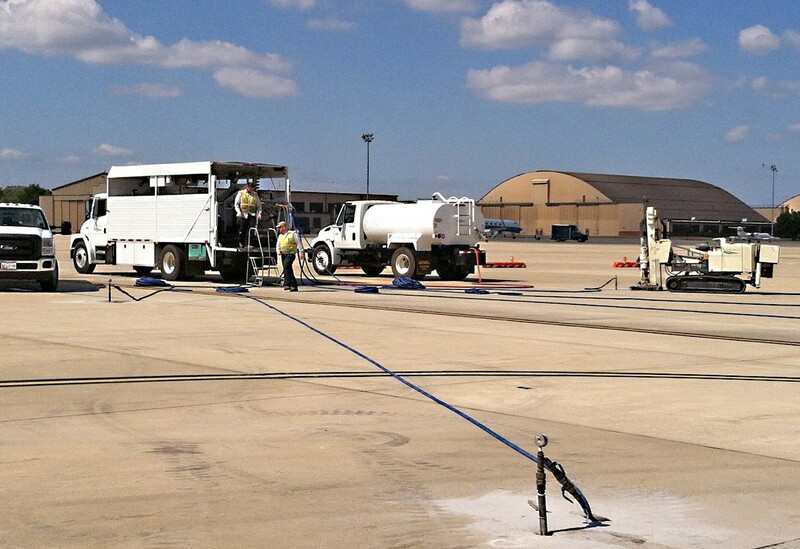 During the proposal stage, it was decided that ISB injections using direct-push and/or horizontal well technology would provide the most effective remediation of chlorinated solvent contamination with the least amount of impact to the airfield operations. This approach has been proven effective in satisfying AF goals by utilizing natural biological processes, reducing contamination, speeding up SC schedules, minimizing time spent on the airfield, and eliminating remediation infrastructure that could interfere with airfield operations.